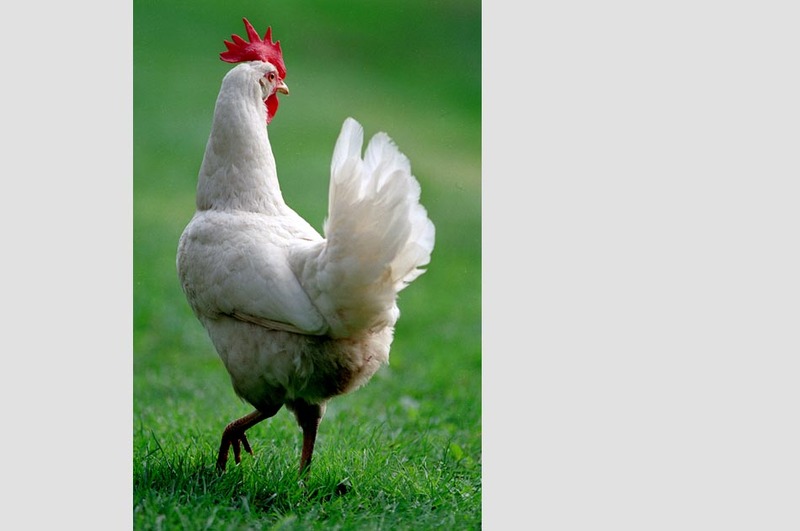 A White Leghorn hen struts across the yard at Tom Powers' home in South Royalton, Vt. Powers said she showed him how chickens lay eggs. Just before the egg comes out, the bird stands up. A Columbian Wyandotte hen scratches for seeds, insects and pebbles in the woods behind the chicken coop on Carrie Maynard's property in South Royalton, Vt. Maynard said her chickens will even eat mice and frogs if they cross their path. 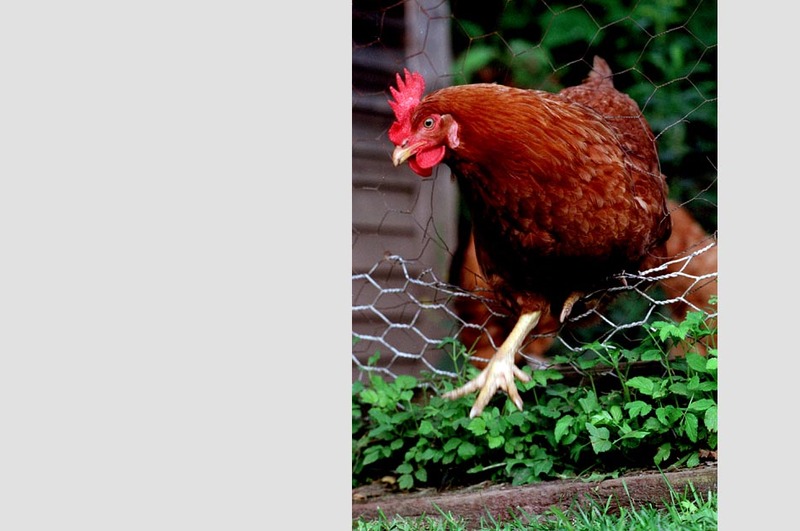 One hen finds a hole in the fence to her liking and gets out to stretch her legs at Tom Powers' home in South Royalton, Vt. Powers patched up the fence because the chickens were helping themselves to produce in the garden before the humans could get their share. 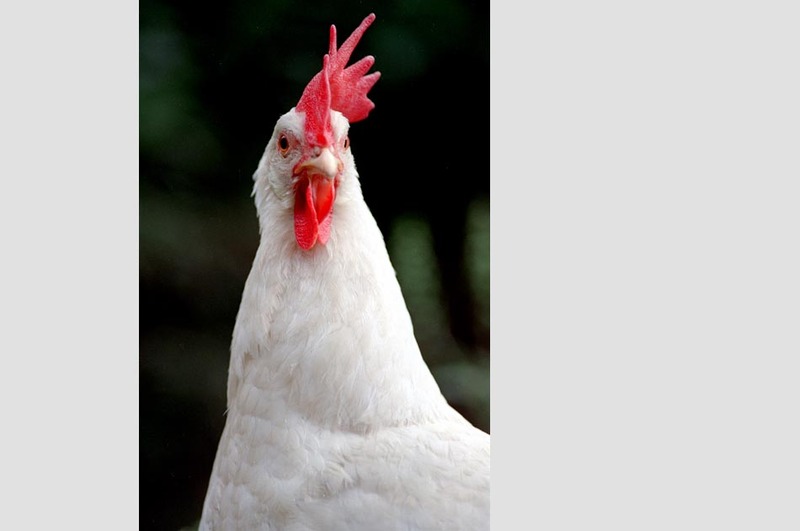 A White Leghorn hen poses for a portrait at Tom Powers' home in South Royalton, Vt. 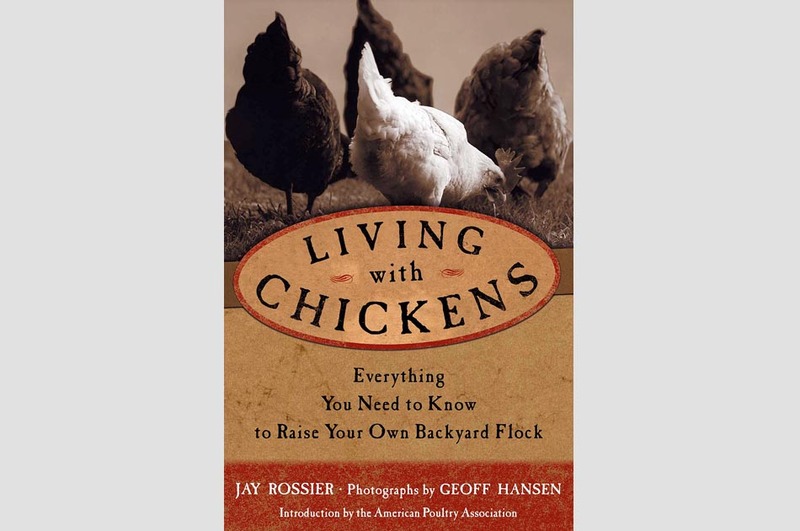 Powers said he's always liked chickens, and having fresh eggs is one of the three things he cherishes about living in the country — the others are picking ripe blackberries and digging potatoes out of the warm ground. 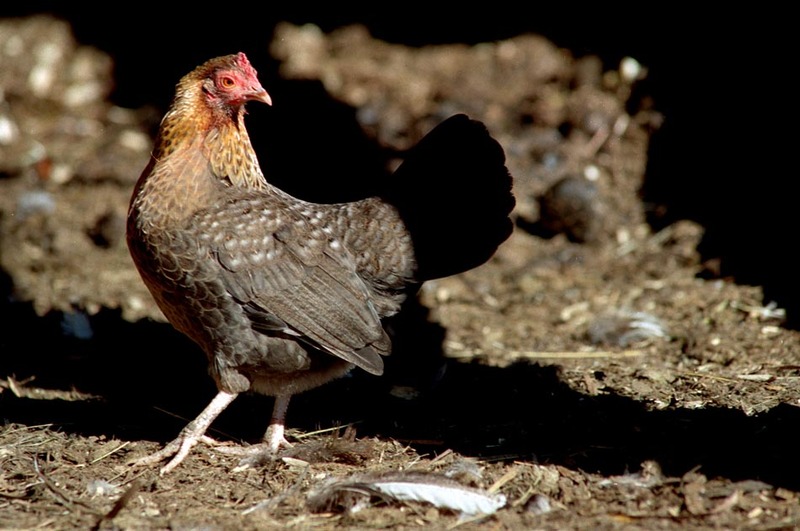 A bantam Old English Game hen — which is "cuckoo" in color — steps highly in Carrie Maynard's barnyard in South Royalton, Vt. Except for one, Maynard's bantams sleep in the rafters of the barn, protected from predators by the two draft horses who share the space with them. 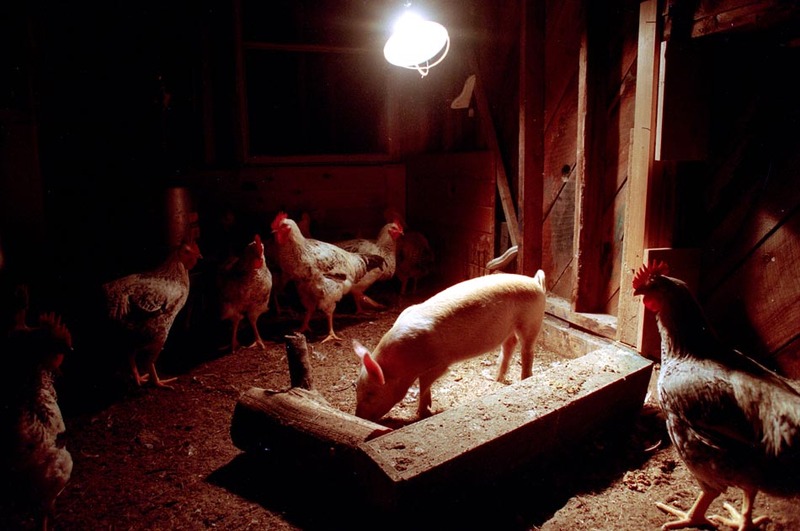 Frye the piglet readies himself for bed with a flock of meat chickens at Lianne Thomashow's home in Strafford, Vt. The birds curl up with the pig for the night for warmth. The hog also has been a guard dog for Thomashow's chickens — she hasn't had a problem with predators since getting the piglet at the Fryeburg Fair in Fryeburg, Me. "He thinks he's half chicken, half dog," Thomashow said. 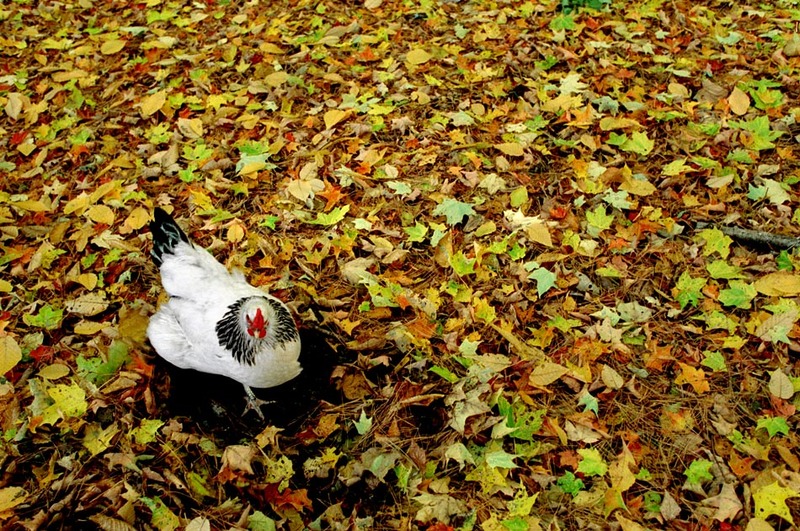 The photographs for Living with Chickens document the lives of chickens in New England through the seasons. Under the careful supervision of their owners, the birds are allowed to roam the woods and garden during the day. Some were fortunate to have a piglet to cozy up with at night.